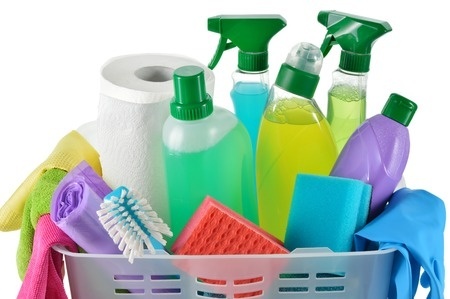 Do you need separate cleaning products for the bathroom and the kitchen? What's the best bathroom cleaner for getting rid of soap scum from your tub? Do you need a disinfectant for the toilet bowl? There is such a confusing array of specialized cleaning products on the market that it often seems easier to use the old tools and methods - or put off housekeeping altogether. Nevertheless, it's time to come clean. But how? Take a look at the surfaces around your home. Is there cooking grease on the stove? Mildew on the shower door? A rust stain around the tub fixture? Identifying the dirt you see and anticipating the germs you don't are the first steps to determining which products you'll need to get the dirty jobs done without damaging the surfaces. Product labels are your best source of information. All-purpose cleaner; oven cleaner; tub, sink, and tile cleaner - the name usually says exactly what the product will do. If the name doesn't tell you, the label on the back will. Here you'll find the types of soils and surfaces the product can - or can't - be used on. Next, consider your style of cleaning. Are you a once-a-month, bucket-wielding cleaner? If so, you'll want to stock up on heavy duty cleaners designed to tackle tough dirt and grime. If you prefer more frequent, quick cleanups - the simplest way to keep cleaning time to the absolute minimum - the mild, all-purpose cleaners and a couple of site-specific cleaners, such as a toilet bowl disinfectant and a tub, sink, and tile cleaner, are all you'll need to keep the surfaces in your home sparkling. For those who prefer "natural" or environmentally friendly substitutes, the choices are mushrooming. Not only are suppliers creating new earth-friendly cleaners, but traditional products are containing more natural ingredients. A few things to consider when choosing between so-called natural and synthetic products: Whether naturally or artificially derived, all ingredients - even water - are chemicals. There are no nontoxic substances. Store-bought housekeeping products are required to meet standards for safe disposal down your drain, but alternative household cleaners aren't evaluated in that context. Commercial products consistently outperform their home-mixture counterparts. Homemade cleaners generally require a great deal more time and elbow grease, however. The single exception is home-mixed glass cleaner: 1/4 cup (60ml) of vinegar in 3 and 3/4 cups (900ml) of warm water. Learn how to create a house cleaning schedule for your home here.